The staff will spent most of the day today putting the course back in order after Saturday night's storm. The blowers are out windrowing the leaves for the vacuum sweeper to pick them up. Bunkers are having to be blown out and the sides pushed up as usual during heavy rain events. Even though the construction work will be difficult, it will be GREAT to have new bunkers this fall so we can spend time on other areas of the course! Blowing twigs and leaves from bunkers. 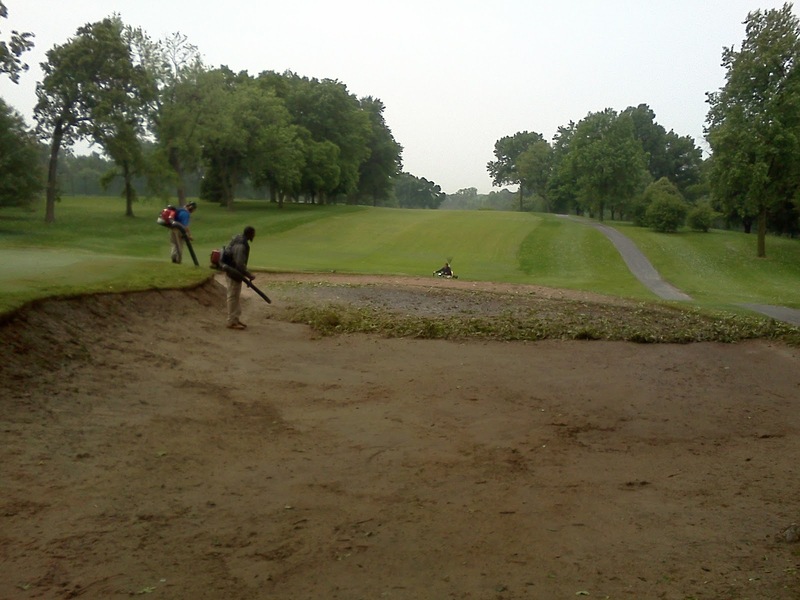 The faces all must be pushed up with the bunker rake and then hand raked smooth for play. Tom operating the leaf vacuum. The area to the right was swept clean. 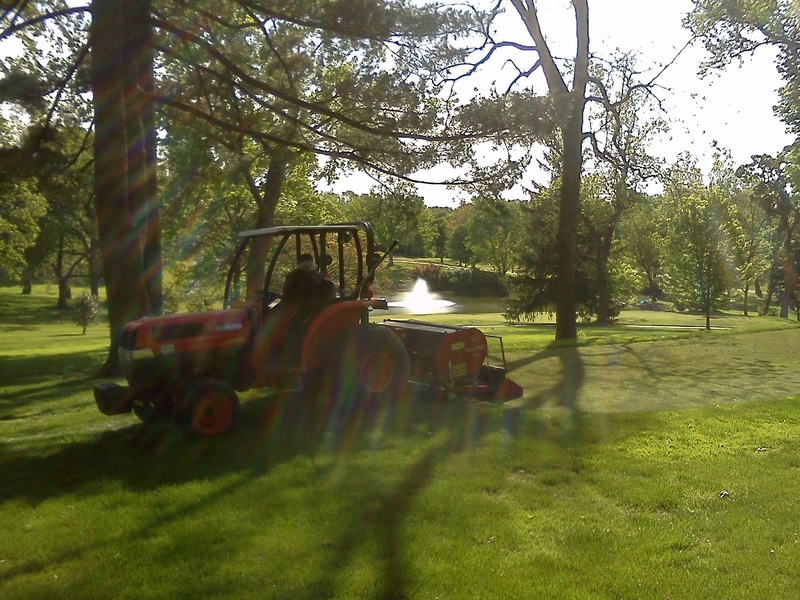 Time for the mower to get out there before the next rain comes in. 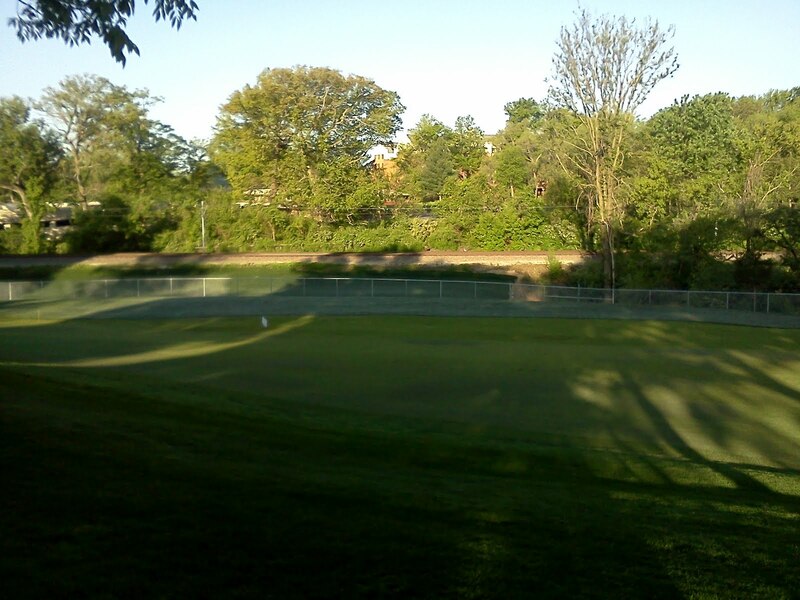 The rolling of the greens helped smooth out most of the damage we experienced from last night's storm. There are a few spots that left a smaller ball mark but overall we escaped a bullet from what I saw on the news last night. Hail that can break through sky lights and car windows would have severely damaged our greens. I think we will see some slight browning from the tips being damaged from the mark but no worse than normal ball marks. After a few days of mowing and growing, the marks should go away. We might have to spend some time repairing a few of the larger marks over the next couple of days. 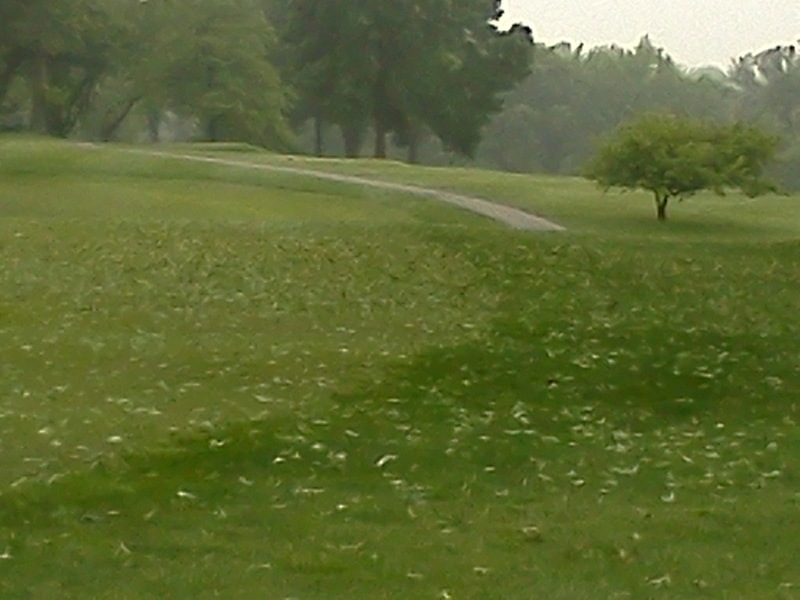 The leaves had to have been raining down like confetti all over the golf course during the storm. Should create no problems for the trees. Most of them were fully leafed out so they should recover without any issues. Very little damage from high wind. Just a limb here and there. Hopefully the rain will stay away long enough for us to get the fairways blown off and some windrows leaves that were knocked off the trees. We will mulch them with mowers as well as pick them up with our leaf vacuum. Another 1.81" of rain from yesterday's three separate rain events. Bunkers area a disaster again but were all pumped out today by about 1:30 p.m. for those adventuring out on the course. 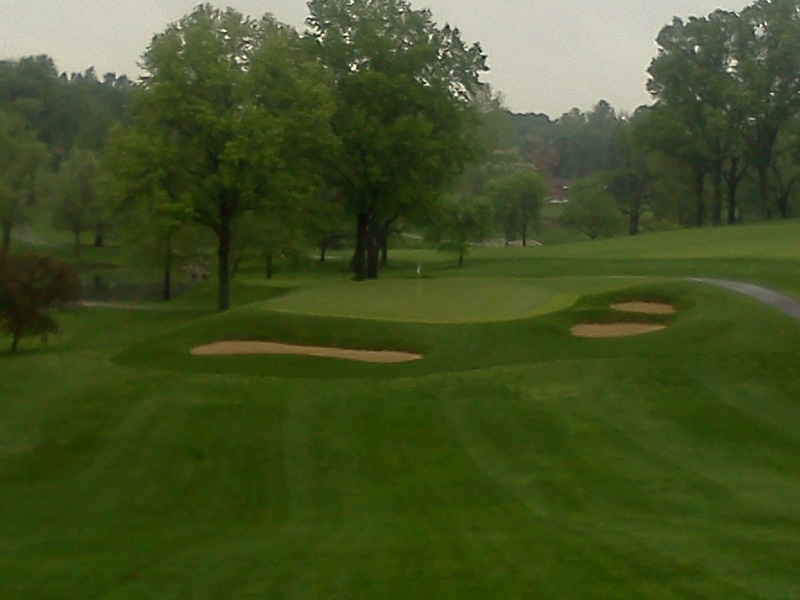 #14 bunkers look great. Just a very slight bit of erosion on the top side of the bunkers but overall in good shape. 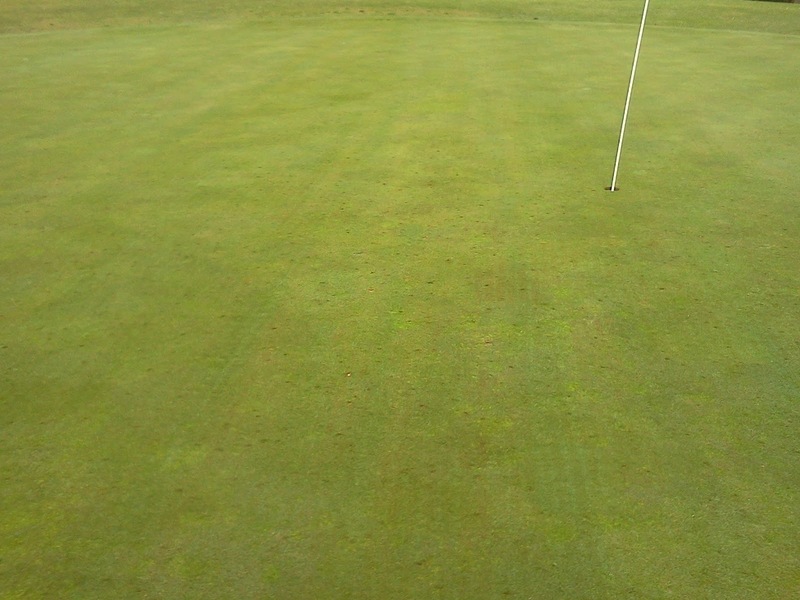 You can see some of the marks on green #3 before they were rolled. For the most part, the rolling smoothed over most of the damage from the hail. Looking back toward #18 tee. Just a sample of some of the our leaf issues. If you have trees in your yard and experienced some of the hail, you can look out onto your yard and imagine how many leaves were knocked off of the 1,000 or so trees we have between the fences on the property. We had a significant hail storm at Glen Echo on Saturday evening. Most of it appeared to be pea sized but some dime to nickel sized. Looks like 6 strikes per sq. ft. Over 600k strikes total. They will show some bruising over the next few days but overall will be okay. 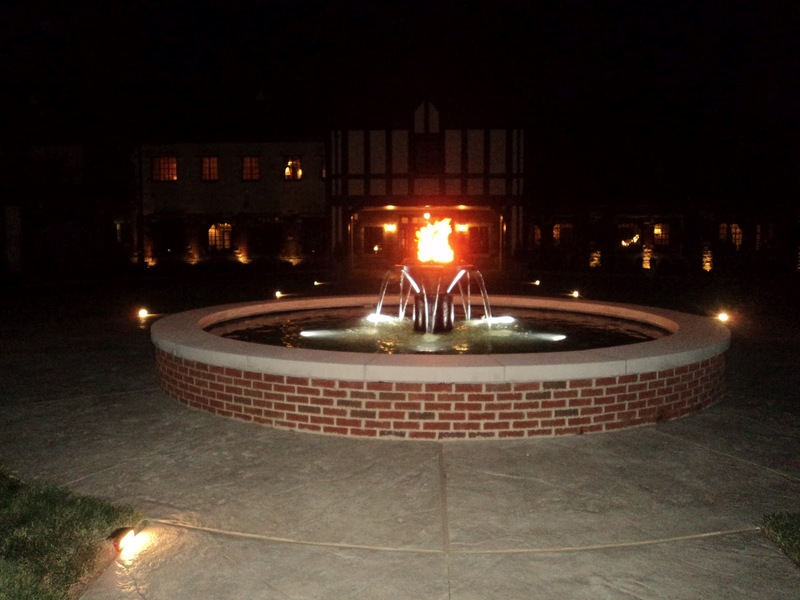 On Wednesday and Thursday, the Water and Fire Feature were installed as a part of the Marvin Pierson Memorial Plaza. 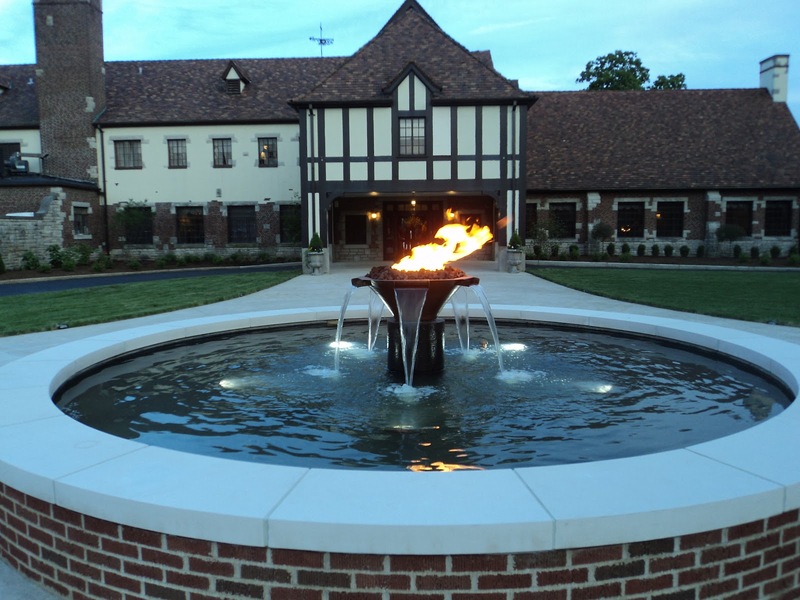 The fountain pool was filled and the fire was lit just before Mrs. Alberici completed her round. We are nearly completed with the work in the ornamental beds which is the final piece in the puzzle. Becky should complete this work next week. A few views of the new feature. Last season #13 blue tee was rebuilt. During the process the center to back of the tee was very soft and would not compact. Due to time constraints, we had to lay the sod and proceed with opening the tee. Over the last 9 months, the middle to rear of the tee settled a couple of inches. The staff removed the sod yesterday, added additional soil and placed sod back on the tee. 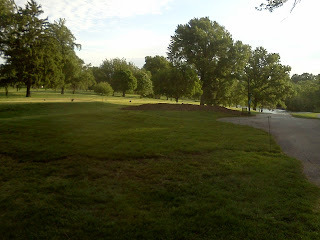 In the interim, the tees will remain on the front of the teeing ground until the sod becomes fully rooted. Also, the new Mickey Mouse bed has been completed, old walkway and ornamental bed was leveled and sodded with fescue. Blue tee after some additional leveling. The tee will be rolled early next week after the weekend rain. 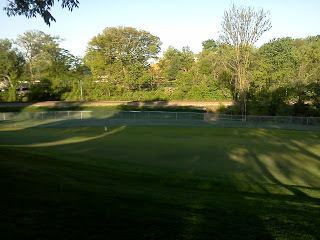 The old ornamental bed at 13 tee after it was sodded. 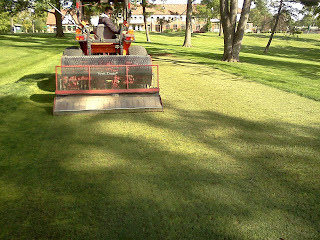 The cool season tees were core aerated yesterday. 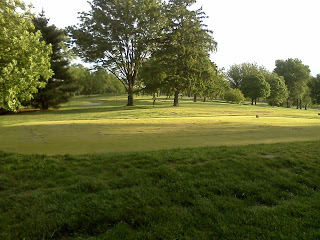 The tees make up parts of holes 2, 3, 10, 11, 14 and 17. 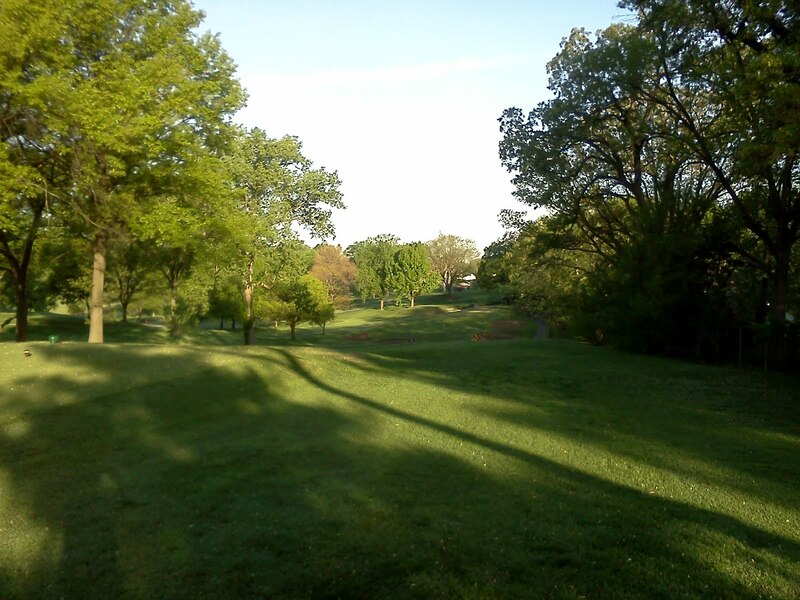 Cool season tees from what I can tell have been used at times here at Glen Echo because of shade conditions. 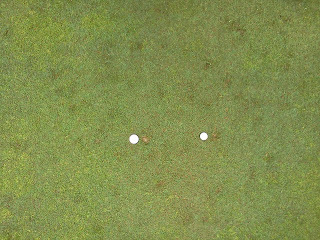 Zoysia/bermuda do not grow well under low light conditions. 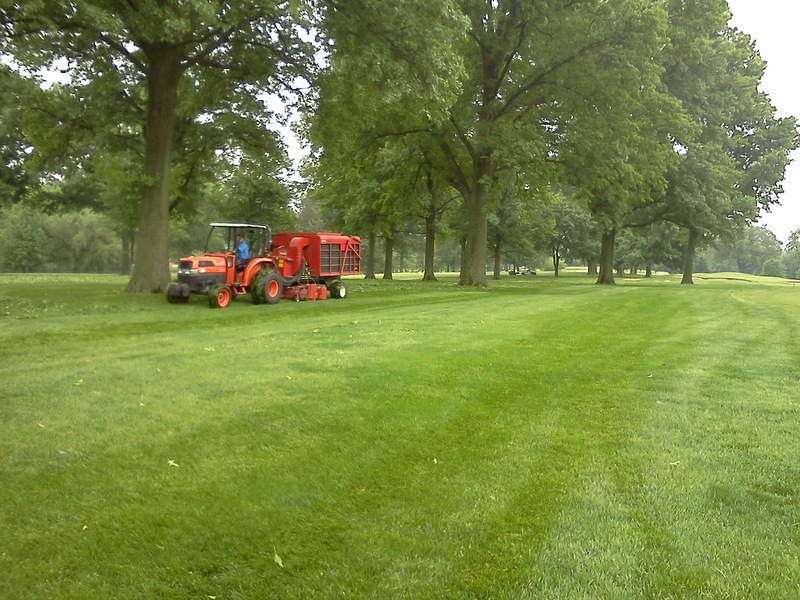 Cool season tees cost us more money to maintain because pest pressure and renovation including seeding must be ongoing during throughout the season. The solution for this problem is to remove trees which is practical in some situations and not as practical in other situations. 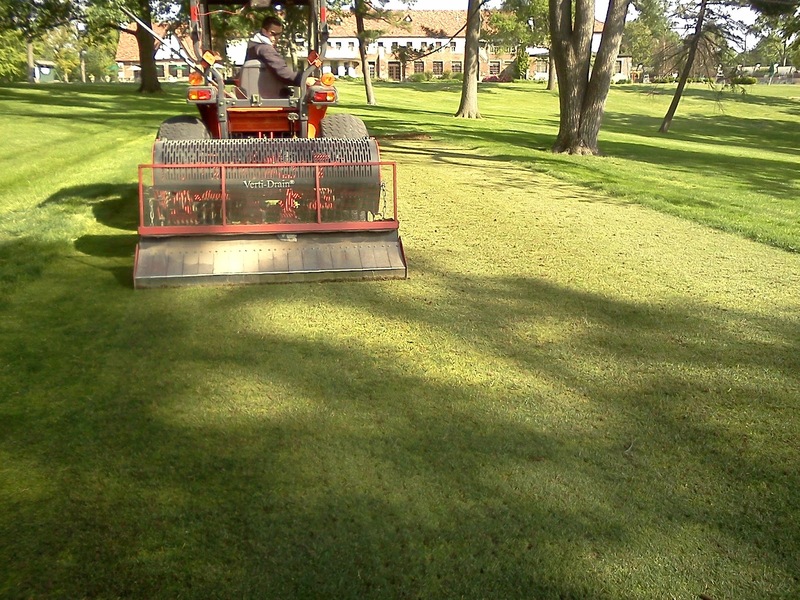 Once the aeration was complete, the tees were topdressed with sand and the sand was brushed into the holes. We need to add some additional sand to fill the holes but overall the process went well. 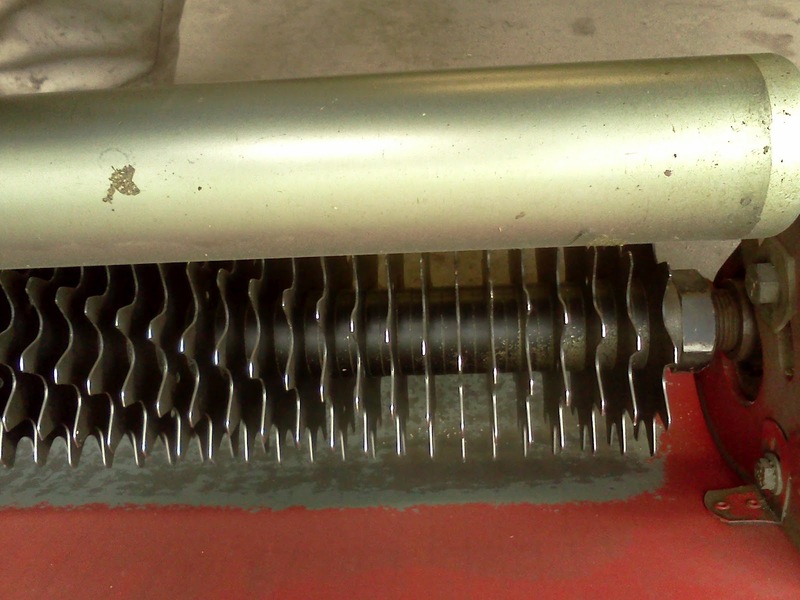 The core aeration improves water penetration as well as water retention near the top few inches in the root zone. Water moves away from the surface but will also sit in the aeration hole and slowly move down through the root zone profile. It also improves gas exchange with O2 entering the soil and CO2 leaving the soil. The sand topdressing gives an improved environment for root health in the holes and will improve surface drainage as we continue to place more sand on the surface and raise the level of the tee. 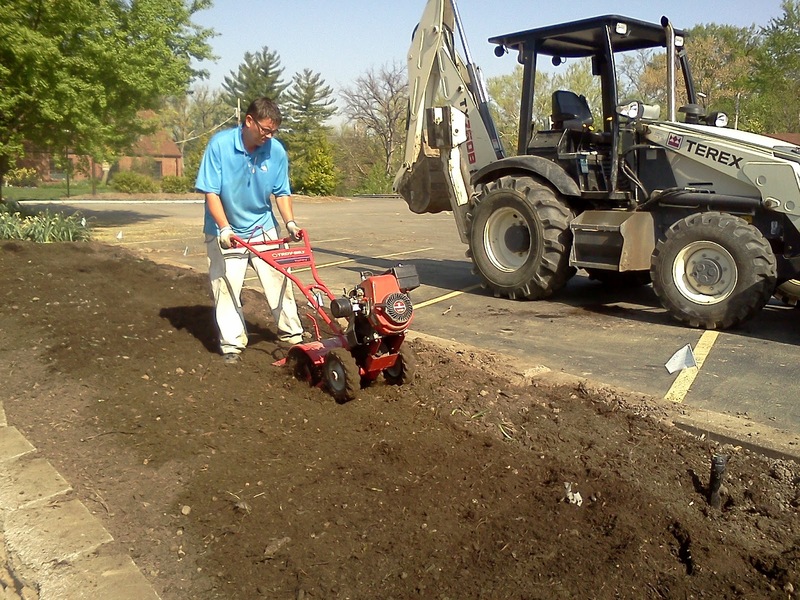 It also softens the surface allowing a tee to be placed into the ground with ease. 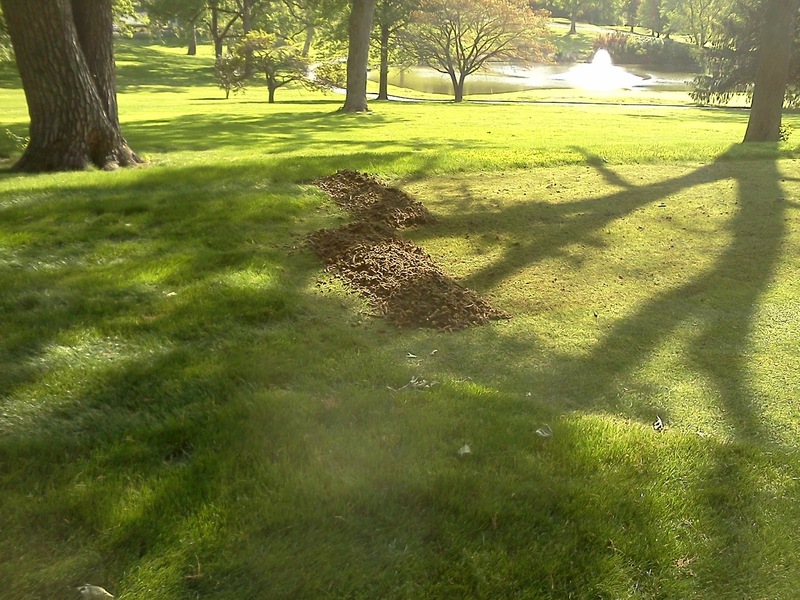 We core aerate tees in the spring and fall. 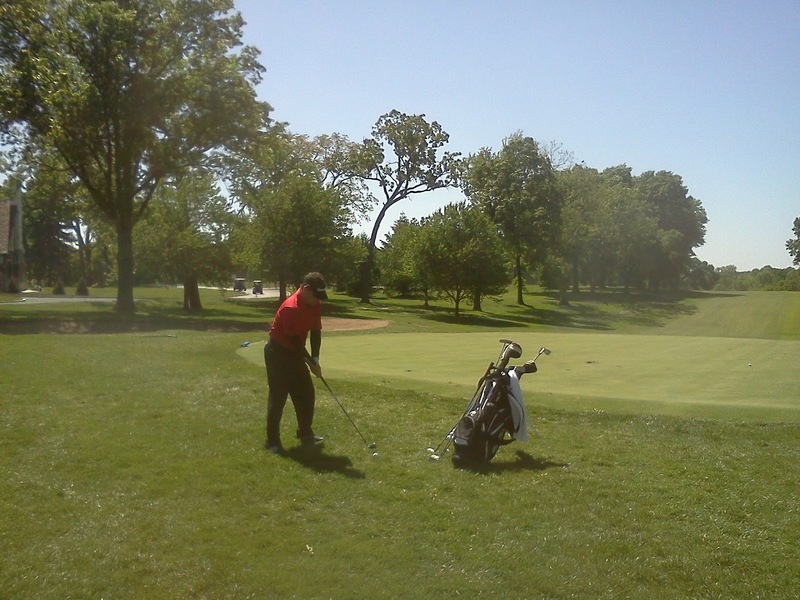 Tom Lewis aerating #10 tee. We went to a depth of 3-3 1/2" in depth with a 1/2" tine. 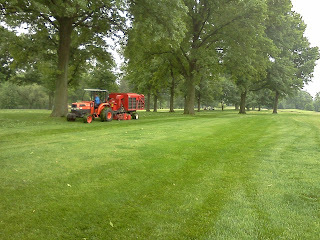 The drag attached to the aerator so it can drag the cores to the end of the tee . 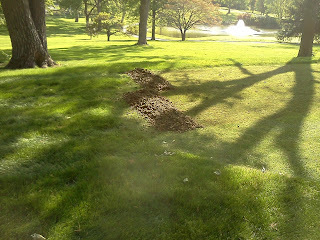 Piles of plugs at the end of the tee ready for removal. We have met our goal of $ 162,000 for our Bunker Restoration Project. Thanks to our membership for your cash donations, participation in the golf tournament, dinner/auction and the many items that were donated for the auctions. Individuals who have not donated to the fund can still make a pledge by contracting Mary Martin. 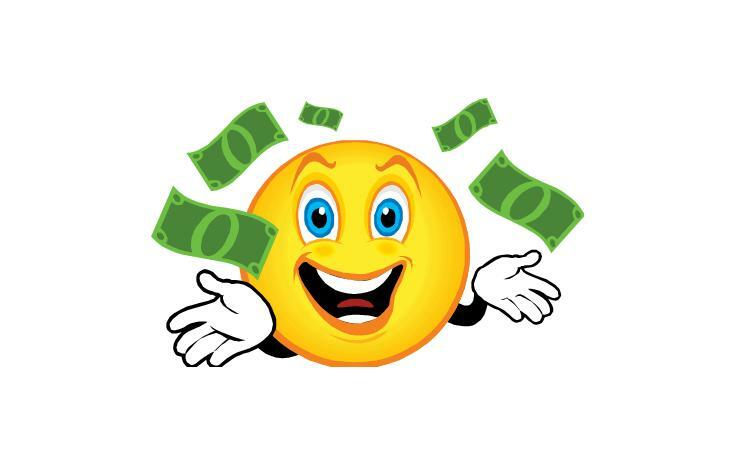 If there is money left over after the bunker project is completed in the fall, the money will be utilized for additional improvements to the infrastructure of the golf course. Thanks to our fundraising committee for their work as well as a special thanks to Rob Stewart COO for pulling everything together. Thanks to Kevin and Adam for a fun day of golf, Chef Rob, Terry, Vince and the rest of the kitchen staff for a great meal and Reid and all of our wait staff for their efforts in taking care of everyone at the event. Can't forget our administrative staff, Mary Martin Controller for helping to keep our money straight. Also, Kim, Roland and our setup staff who had the house looking great! WE HAVE A MOST GENEROUS MEMBERSHIP!! PGA Tour Professional Jay Williamson giving a clinic before the start of the tournament. 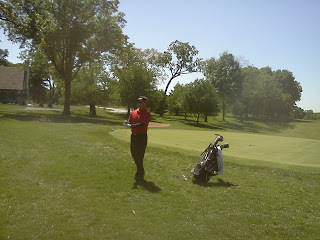 Jay explaining a swing thought. From left right, Mr Jack Powers, Mr. Bob Goalby, and Mr. Jay Randolph reminiscing before the dinner auction about our great club and golf in general. The 4th Annual Glen Echo Greenhouse Plant Sale will take place on April 28th from 9-11 a.m. at the grounds maintenance building. Becky has a number of perennials and annuals that will be available for purchase. 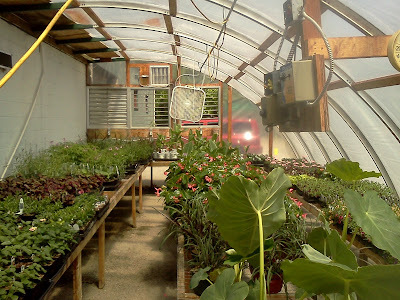 I will make a more detailed posting early next week with plant varieties that will be made available. We normally host the event the day before Mother's Day but with the early break in the weather, we thought we would move up the date a couple of weeks. The Lucas & Hunt Road entrance will be closed until Wednesday morning. Early this past week, we vertical mowed the greens. This is also referred to as verticutting. Instead of setting the unit above the height of the green as a conventional mower, it is set at a depth below the surface of the greens so it will cut into the surface of the green. There are a number of different benefits to this process. The first helps to reduce the thatch/mat layer of the green. The 37 blades on each of 3 reels will cut through the surface and remove some of the dead plant material. Topdressing sand is applied to the green and the sand takes the place of the dead plant material. This will improve firmness of the greens surface and does provide some gas exchange near the surface of the green. Since we had recently aerated our greens and had a great deal of sand near the surface, I did not want to go extremely deep with our operation. 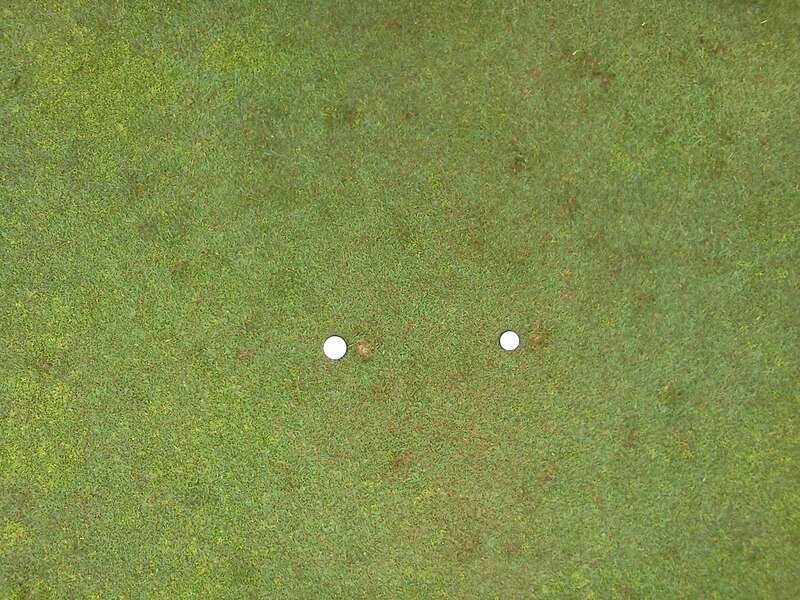 Our purpose was to cut through the bentgrass that by its nature grows sideways and will attempt to lay over. The vertical action of the mower cuts through the longer leaf blades. The cutting action of the mower will also stand up the leaf blades. The less grass surface that the ball touches, the less friction created and the better ball roll that our greens will have. We will do a lighter version of this work during the season until the heat of summer kicks in. Russ vertical mowing the greens. We went two directions to increase the amount of surface that was disrupted. New employee Jeff brushing the greens to help stand the grass up for regular mowing. Not pictured is the actual mowing of the greens. 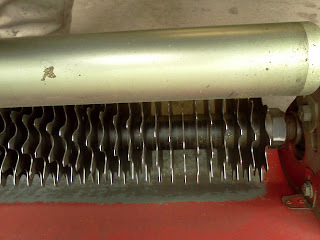 The view of one of the vertical mowing reels. 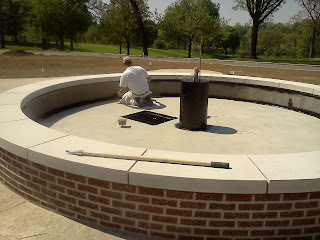 The Pierson Memorial Plaza is nearing completion. We took major strides this week in closing out the work that the Grounds Maintenance staff has been responsible to complete. Irrigation was completed and recharged. Becky has been busy with placement of trees with the help of our staff. She has also been involved in planting the many shrubs that are included in the new design. 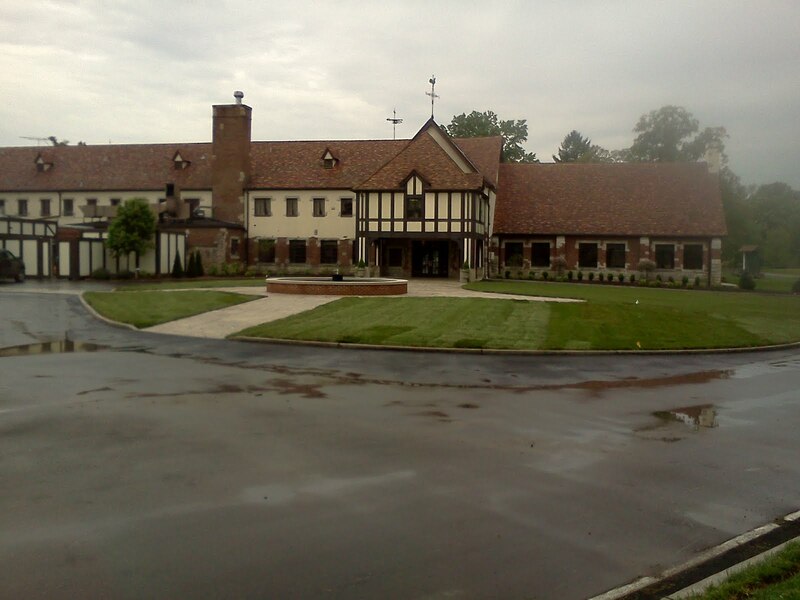 The lawn area was shaped, raked and sodded with some great looking fescue from Keeven Brothers. We still have some adjustments to make in the irrigation system to insure that the heads are covering the areas that we want covered. A couple of the areas need some additional settling near some heads and valve boxes and will be sodded early next week. Becky has to plant a few more shrubs and has annuals, perennials and herbs to add to the landscape area. 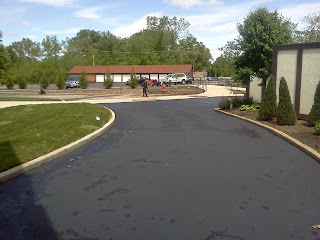 The contractor is sealing the asphalt in front of the club on Monday weather permitting. 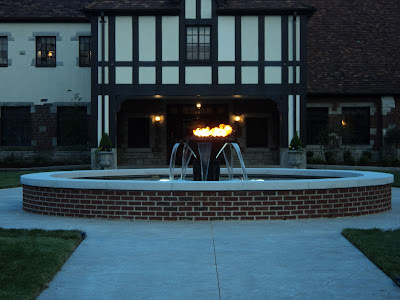 The only other item that we have is for the fire and water feature to be completed, shipped and then installed. We hope this will occur within the next two weeks. Digging in new Junipers along the loading dock wall. 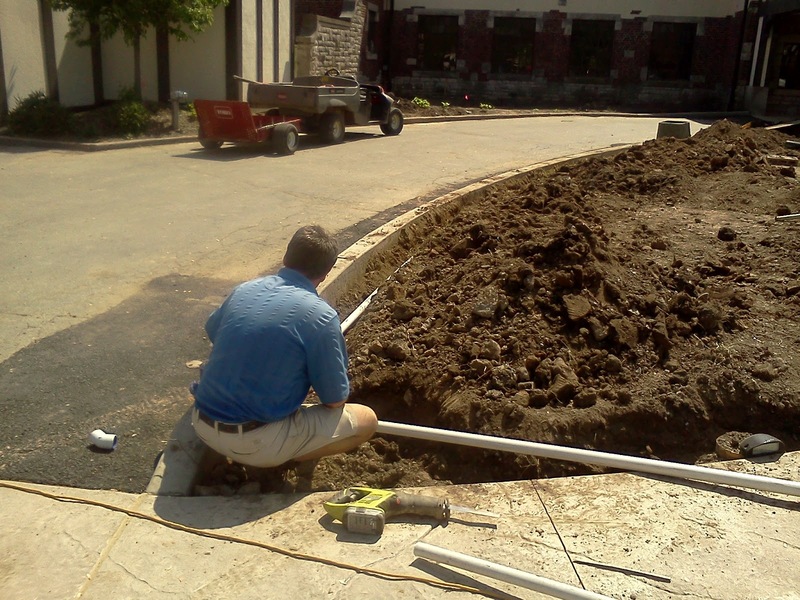 Extending the curbing near the fire hydrant with an old concrete paver. Serviceberry tree being planted near the main dining room. Fat Albert Spuces, Tree Lilacs in the background installed along the living room. Becky added some additional shrub plantings along the living room. Skip and Tom finishing the last of the irrigation in the front lawn. 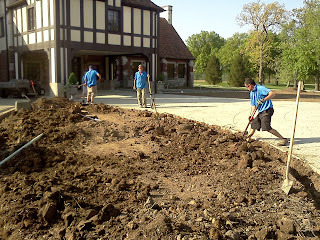 The staff laying the big roll fescue sod on the front lawn area. Additional sod work. 26 rolls of sod 3' wide by 120' long were placed on the front lawn. 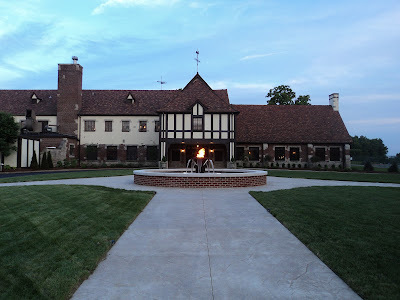 The front lawn and the new Pierson Memorial Plaza area. What a great change to enhance one of the outstanding clubhouses in the country. The new fescue turf was laid yesterday and Becky and the staff gave been preparing the kast of the.ornamental beds and filling them with.trees and shrubs. 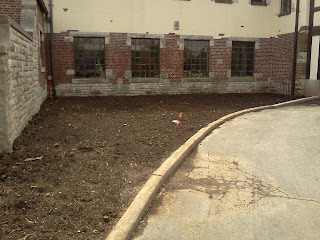 Additional perennials, annuals and herbs will be planted in the coming days. What a beautiful view looking at the front of the club. Temperatures have gotten back to more normal levels over the last week evidenced by frost on the new fescue rough along #1. Mid 30's here in the big smoke. (city) These types of temperatures will slow the zoysia/bermuda but should do no harm. We would have to get temperatures in the mid to low 20's before the warm season turf could be forced back into a short spell of dormancy. 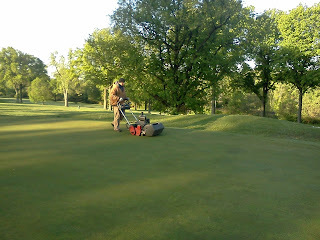 The staff are completing their first walk mowing steps of the season today to our greens. I believe last year we started on April 21st. Ball roll and healing continue to improve from the aeration 14-15 days ago. What a day Good Friday brought to Glen Echo. 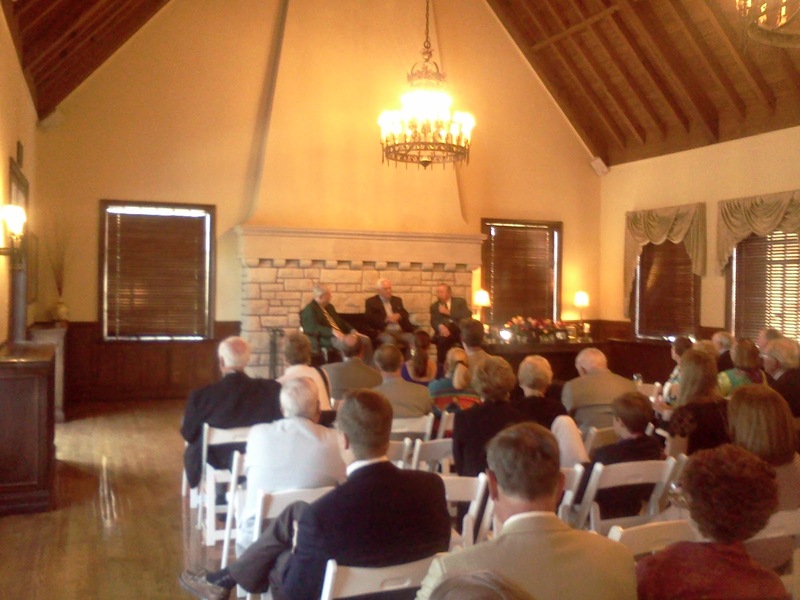 Both the course and the house were busy throughout the day. Staff were out before first light this morning catching up on work that did not get completed because of the rains. 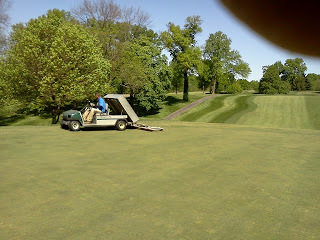 FWYS, Intermediate cut, blowing clippings from fairways(unbelieveable for April 7), bunkers raked and course set up. We dropped our greens height today. We will do some additional grooming and rolling this week to improve ball roll. The staff worked feverishly on a number of different Pierson Memorial jobs Monday. Hand digging to install the irrigation was completed on the two small lawn areas next to the loading area as was the last ornamental bed near the casual entrance. Installation of pipe and heads on a couple of the beds is taking place on Wednesday. The areas were not large and there were too many wires and pipes in the small areas to safely utilize a trencher. We still have to add 4 additional heads to the main lawn area and the trenching required to install the irrigation pipe for the system. This will hopefully get completed this week as we make a major push in trying to get the lawn sodded by the end of this week or early during the week of April 9th. The staff prepared the long ornamental bed between the main parking lot and the delivery area. 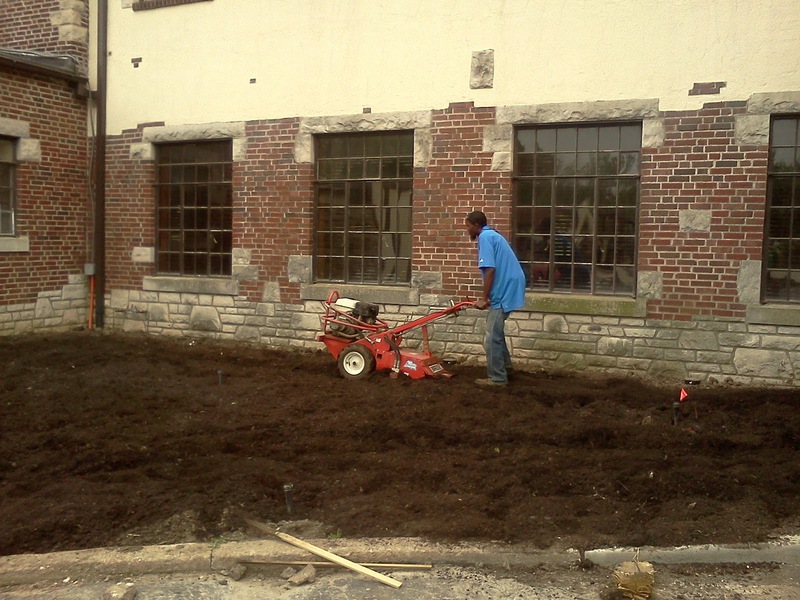 The soil was tilled a couple of times and compost was added and tilled a couple more times. On Becky's direction and assistance, Green Giant Arborvite were planted to provide a screen between the main lot and the delivery area. 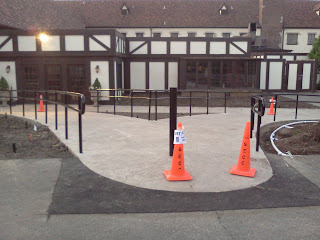 Additional tilling and planting will take place over the next couple days around the formal entrance area. The main dining room bed should be planted today and if rain holds off the living room bed will be completed on Wednesday. 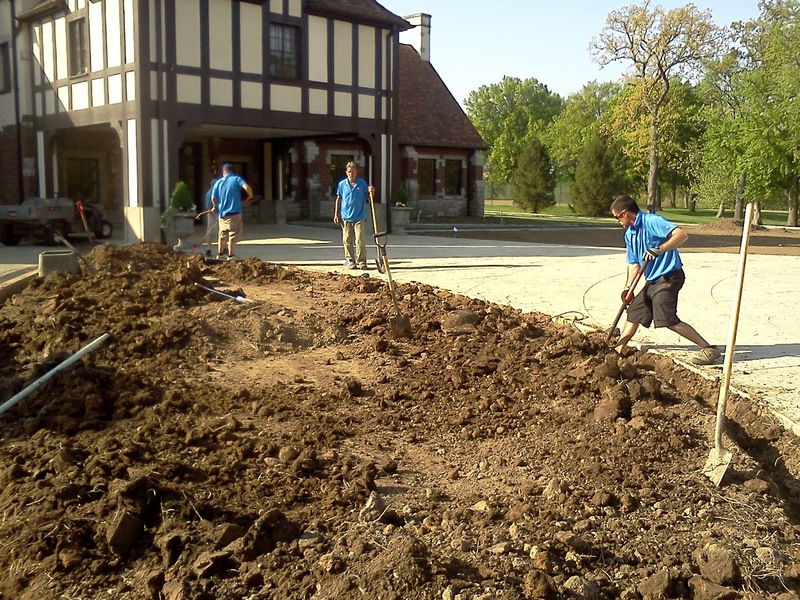 We will also continue our work in the ornamental areas around the casual entrance. The beds still need soil hauled in and will require a great deal of tilling with a lot of compost that will be required to improve the overall heath of the plantings. I would expect the trees and shrubs for this area will be planted next week. Perennials ordered for this area are to arrive sometime during the week of the 16th. 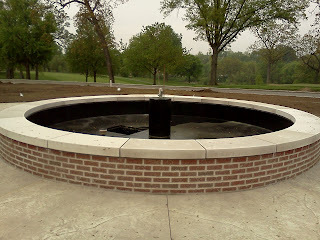 The painters from Bazan Painting were here and epoxy the fountain pool/pedestal as well as polyurethane the handrails. They came back on Tuesday and completed their task. 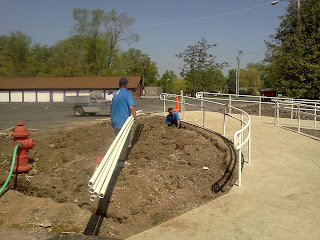 The lighting for the handrails should be installed in the next couple of days. I have a call into our plumbing contractor regarding an approximate arrival date of the water and fire feature. Asphalt sealing of the circle area and the main drive area that connects the circle is scheduled to be completed on Monday, April 16. 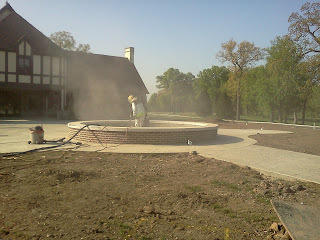 Sand blasting the fountain pool so the epoxy paint will adhere to the surface. The epoxy paint being applied. The completed pool. Why black? 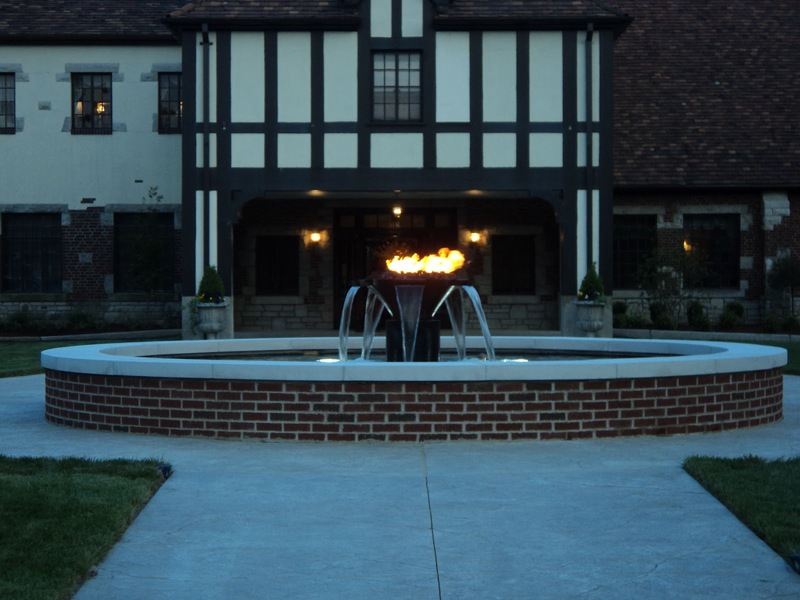 Most pools are being installed in black because of its luxurious look. The handrails after completion. A lot calmer and yes we were required by ADA to install handrails. Russ working on one of the two smaller side turf areas for the new front lawn. Installation of the ornamental bed near the casual entrance. Hand digging along the edge to prevent damage to the new lighting as well as the multiple irrigation, gas and electric lines running through the area. Jeff tilling the bed area between the main parking lot and loading area. 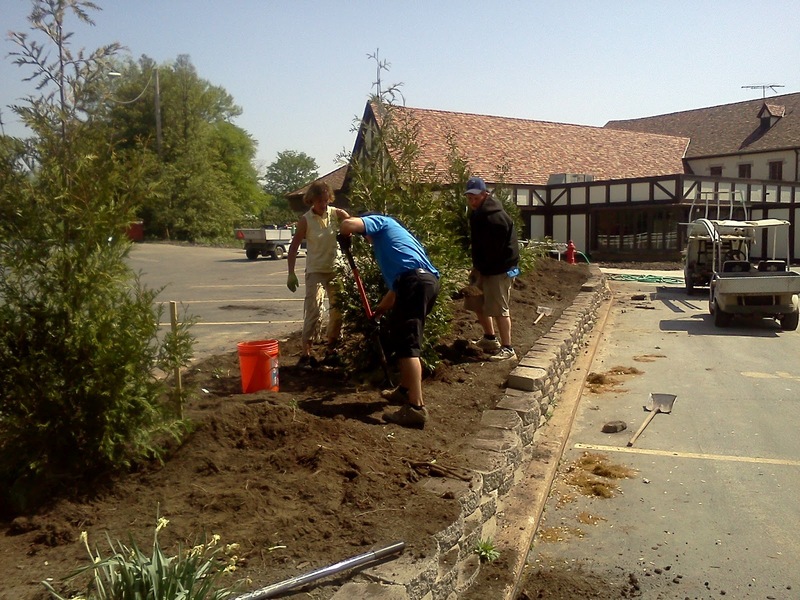 Installation of the shrubs in the area. Contracted employee Jeff tilling up the main dining room ornamental bed on the formal side of the clubhouse. The finished product after being raked and a good rain that night.